Today at the Worldwide Partner Conference, Microsoft took the verbal gloves off: During his keynote, CEO Steve Ballmer mocked Apple’s Mac sales numbers. He compared the number of PCs sold in the last twelve months, some 350 million units, to what he called roughly 20 million units sold by an unnamed, but much hinted at competitor. As it was quite obvious that Ballmer was referring to Apple in his comparison, we looked into the 20 million unit sales claim. After adding up official Mac sales stats from Apple for the last four quarters, total sales were only 15.25 million. If Ballmer was rounding up, or was simply including Linux computer sales as well, we are not sure. The opening keynote then went on to discuss a variety of other Microsoft products. We have condensed the remarks into three sections. Now that the Xbox 360 is the bestselling console, Microsoft can’t stop talking about it. Today Microsoft went over the coming voice command features that the Xbox will support, via Kinect, to make it a mostly hands-free experience. Also demoed was the coming Bing integration into the Xbox ecosystem, bringing new name recognition to the Bing brand, and likely simplifying the use of the console as an entertainment system. 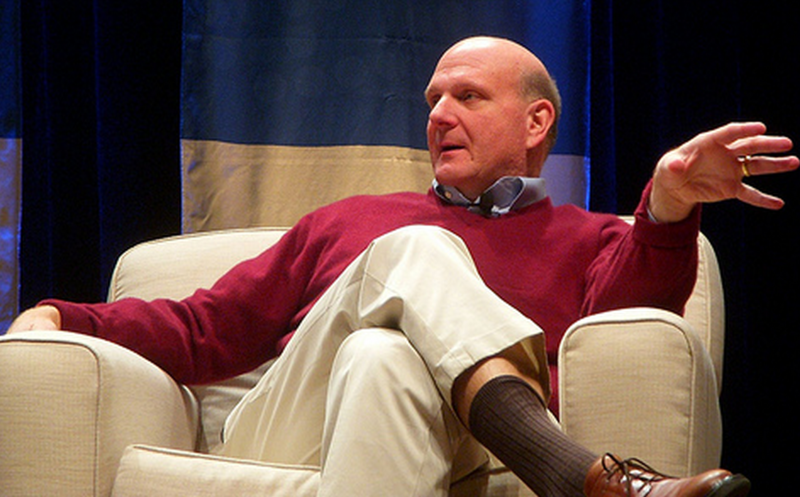 Good news: Ballmer did say ‘Zune’ in his talk, so the brand lives another day. Also included in the remarks were a few paragraphs on Bing, discussing its management of Yahoo’s search queries, and stating that its market share continues to rise. That is not new, of course, but it is important to keep in mind. But the company was optimistic that it can continue to raise that number, as some 2/3rds of business computers are still running XP, an operating system that is nearing its ‘death,’ the day in which Microsoft will no longer support or update it. On a more positive note, according to internal Microsoft research, some 90% of enterprise customers are “committed” to moving to Windows 7. Windows 8 was given another run through on stage, but nothing new was announced. What was interesting was Microsoft’s confirmation that at the coming BUILD conference more would be unveiled. Office was also discussed, with Microsoft releasing a sales figure for Office 2010: 100 million licences have been sold. He also said that of all the servers shipped in the last year, 75% shipped with Windows. Microsoft held specific sales numbers out of reach once again, but did say that it had sold “millions of phones,” and claimed that among current users, 90% would recommend the phone line to a friend.